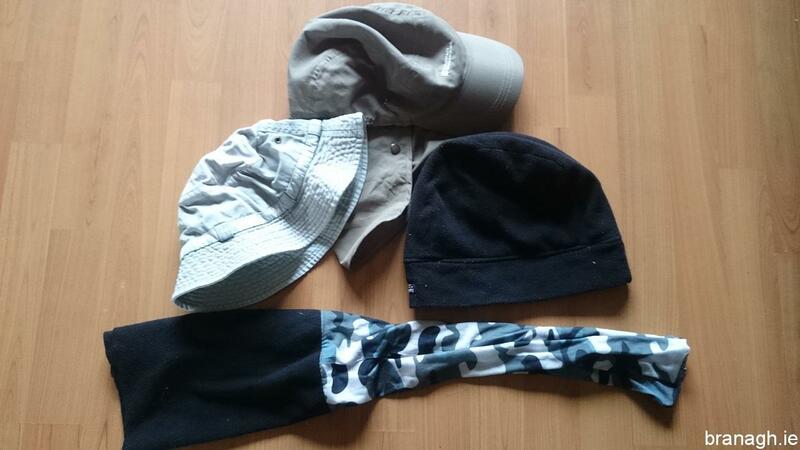 Over the years I have acquired various kit and clothing relating to my time in the outdoors. Below I have provided some detail on items I currently own and my opinions on them. 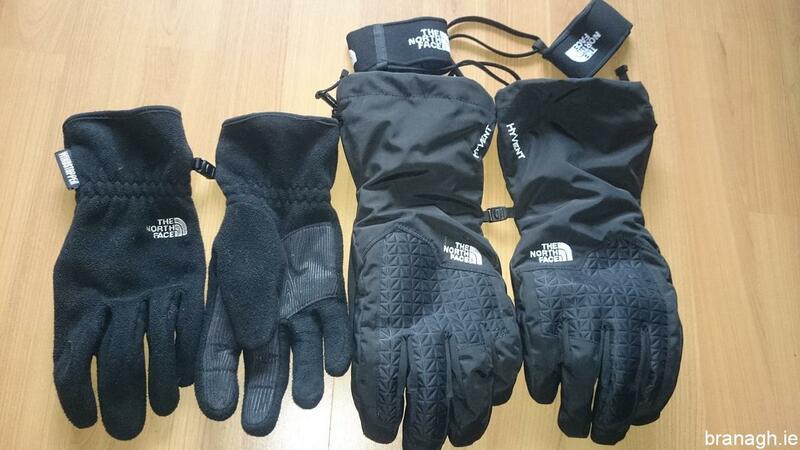 A lot of my gear is by North Face. I am not trying to promote North Face in any way over other brands. 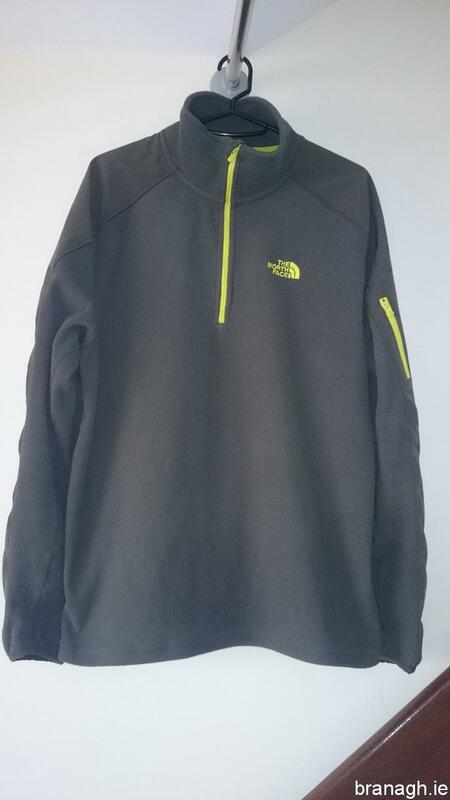 I have not performed any testing between North Face and other brands. 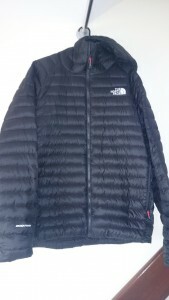 I just started out buying North Face and was happy with what I bought so I generally continued to buy North Face gear. Much of my gear listed below has been used for hiking throughout Ireland and the UK as well as Kilimanjaro, Everest Base Camp and Island Peak. I had went through several pairs lesser quality boos in a reasonably short time before investing a bit extra in good boots. On the left, a pair of Grisport boots that I received as a gift. often wear these on short walks around the Belfast Hills. 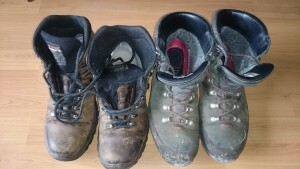 On the right are my main boots, North Face Verbera Backpacker GTX. I bought these over two years ago before travelling to Kilimanjaro. They have had a lot of use since and should have a few years left yet hopefully. I cannot fault them at all. 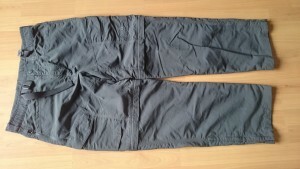 I had worn regular combat type trousers for hiking for many years. I found these very good for walking. Only last year did I buy a pair of dedicated walking trousers. 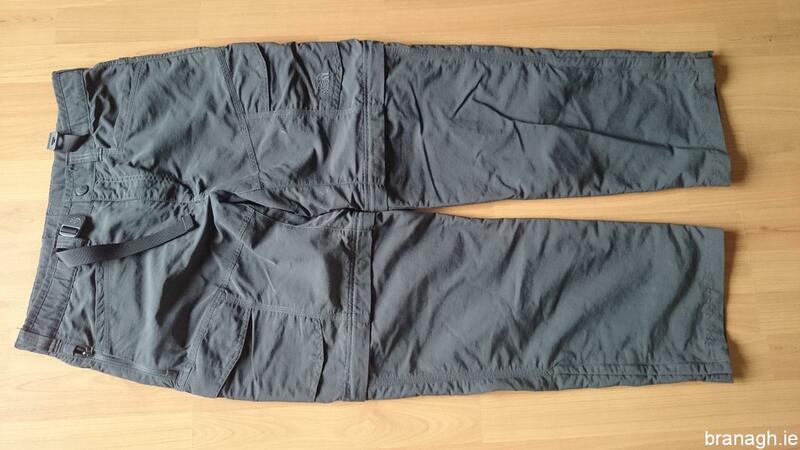 They are North Face convertible trousers / shorts. This feature was useful in the Himalayas last year as I was able to carry less by having my shorts and trousers in one. These trousers also have a secure zip pocket which I found very useful for carrying my passport on my person at all times. They are lightweight but robust and dry very quickly if I get caught out in a shower with no waterproof over trousers on. I have a few of these merino wool long sleeve base layers, Icebreaker. 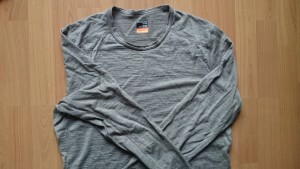 Merino wool had been recommended to me last year as a good material for hpot and cold conditions and will keep fresh during multi day trips. After using these base layers since then, I would have to agree. I absolutely love fleece tops. I have a couple of these North Face fleeces and I wear them when in the hills but also day to day. They are very lightweight, warm and fast drying if they get wet. I have one down jacket. It is North Face, 800 fill hooded. 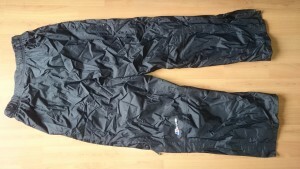 It is very lightweight and warm as would be expected from a down jacket, however it does have one very serious downside. It is more fragile than I would have liked. I often find little bits of down poking out and I have to carefully try and force it back in so as not to lose too much insulation from the jacket. For this reason I now only wear this jacket when camping on cold summits in the Mournes. Gloves are essential. Even in summer months, a couple of thousand feet up in the hills the wind can be very cold on your hands. I have a couple of pairs of gloves. 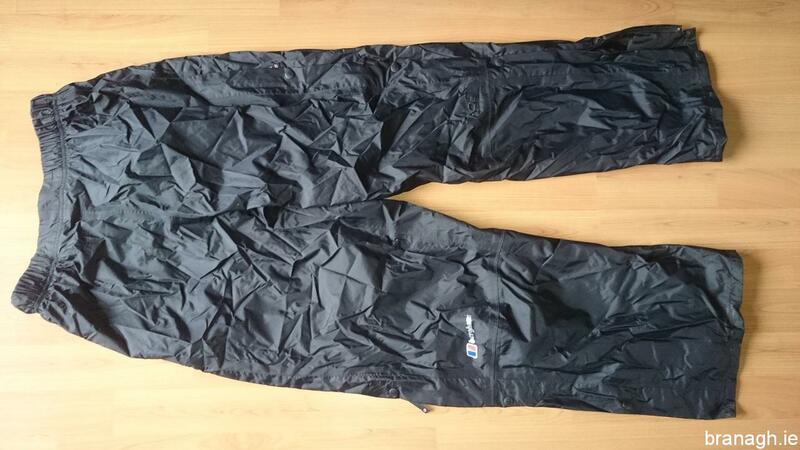 On the left I have a pair of North Face Windstoppers. I have used these a lot, from the Mournes to Kilimanjaro and Everest Base Camp. They are not waterproof but even when wet they still keep my hands warm by keeping the wind out. The gloves to the right are my North Face Montana insulated gloves. These are much heavier and have only so far been used on Island Peak summit day. The idiot loops were perfect for taking photos on the tiny summit. I have several hats. Woolly hats are an obvious requirement in the hills for much of the year. It is also good to cover your head in the summer months if, like me you have little hair to protect you from the sun. I have a couple of sun hats, one which covers my neck also. I also have a couple of buffs for very cold conditions, to keep my neck warm. Gaiters are fantastic for wet and muddy terrain to help keep everything out of your boots. They are also good for anywhere where there is lose gravel. For this reason I sometimes wear them in the summer combined with shorts because I can keep small stones out of my boots but still enjoy the freedom of movement about the knee that I get with shorts. 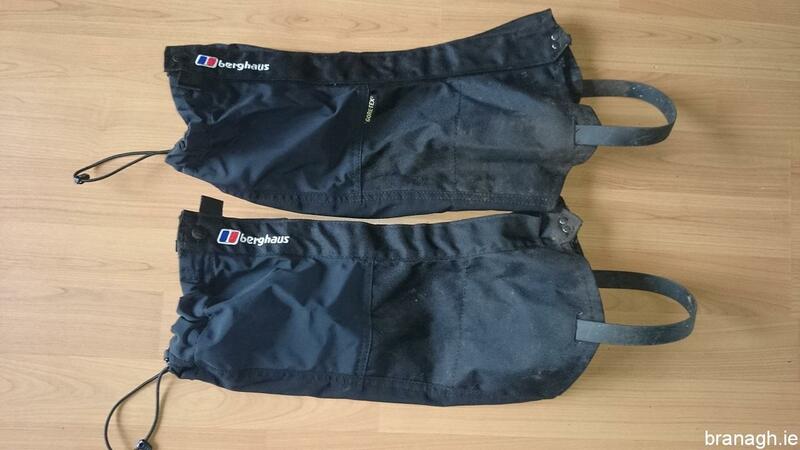 These gaiters are Berghaus Goretex and are very robust. 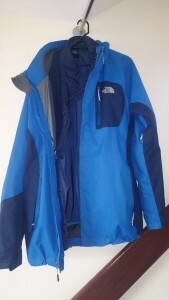 My North Face triclimate jacket is one of my most used items of clothing. It regularly gets used in all three combinations. I will often use just the insulated liner as an outer jacket in the winter months on a day to day basis. The outer shell is easily maintained every few months with a quick wash in Nikwax to restore the waterproof properties. I would definitely recommend this jacket. 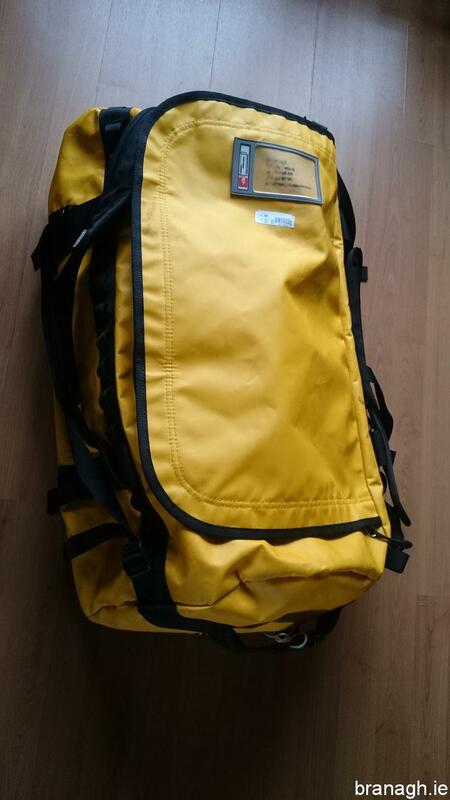 I bought my 90 litre North Face expedition duffel bag last year to bring to the Himalayas. It is very strong which is important when being handled by porters or carried by yaks. I can’t fault this bag at all. If you buy one of these though it is important to distinctly mark it in some way when on a trekking / climbing trip, as many people will have identical or almost identical bags. Berghaus Deluge waterproof over trousers. There’s not a lot I can see about these. They work perfectly at keeping rain and also wind out. They also button open at the sides to make them easy to put on and take off over hiking boots. I have found that to be a great feature. They are definitely an essential item in my backpack when in the hills in this country. My Osprey Kestrel 38 litre day pack. I absolutely cannot fault this pack in any way. I love it. I have found it to be incredibly comfortable, even when loaded up with dumbbell weights last year in the Mournes while training for Island Peak. It has lots of useful pockets, including the usual hook for a water bladder. It also has a built in rain cover. 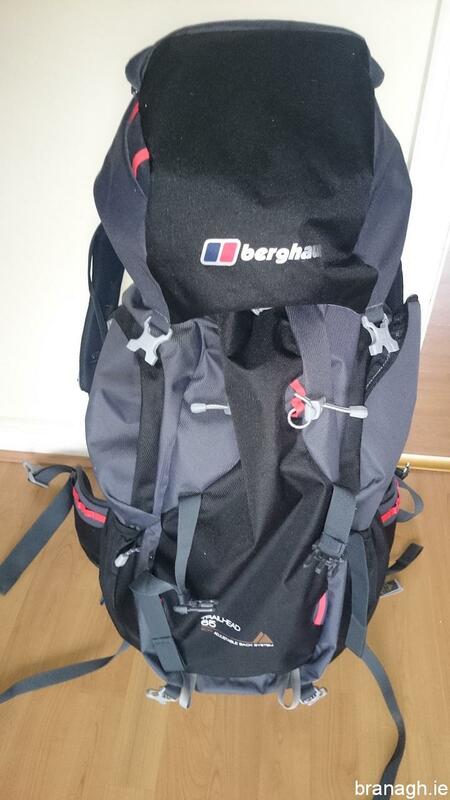 I bought a Berghaus Trailhead 65 litre pack for overnight camping trips in the Mournes. I had really wanted an Osprey Kestrel 68 but at twice the price of the Berghaus I couldn’t justify the cost for the amount of use I get from it. 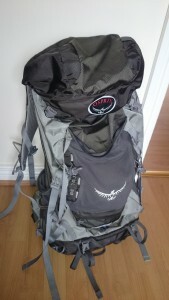 It is definitely not as comfortable as my Osprey pack with similar weight on board but for the price it is ok. It has ample space inside for my sleeping bag at the bottom as well as my Thermarest in one of the side pockets. The tent I attach to the outside. Containers for drinking water are important when out in the hills. 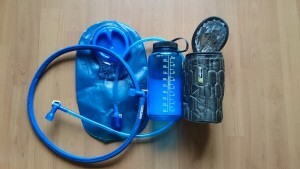 I have a 2 litre Camelbak which I have used for my multi day trips on Kilimanjaro and in the Himalayas. I also use it for camping trips in the Mournes to allow me to carry enough water to summits for cooking and drinking. Generally on single day walks in the Mournes I will only use my 1 litre Nalgene. I have an insulated pouch for the Nalgene which was very useful for summit night on Island Peak. A lesson I had learned the hard way on summit night on Kilimanjaro the previous year. 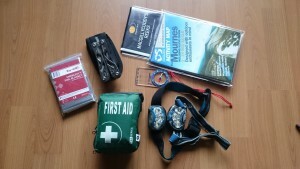 Some items I always carry in my pack when in the hills. Map, Compass, Multi tool, Emergency Blankets, basic First Aid Kit and headlamps. I carry headlamps even if I am not camping overnight because it is always possible that you could get caught in a situation where you end up out after dark. I have two tents. 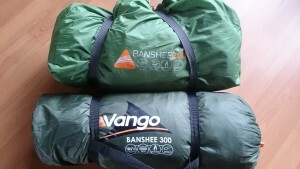 Both are from the Vango Banshee range. I bought the Banshee 200 first. I use it for solo camping in the Mournes. It is fantastic. This tent is incredibly waterproof and incredibly strong. I have learned this first hand from my Mournes summit camps. After my very positive experience I had with the 200 I jumped at the chance when I got an opportunity to buy a 300 second hand in new condition. I can use the 300 when my other half joins me on camping trips in the summer months. My sleeping bag and Thermarest. 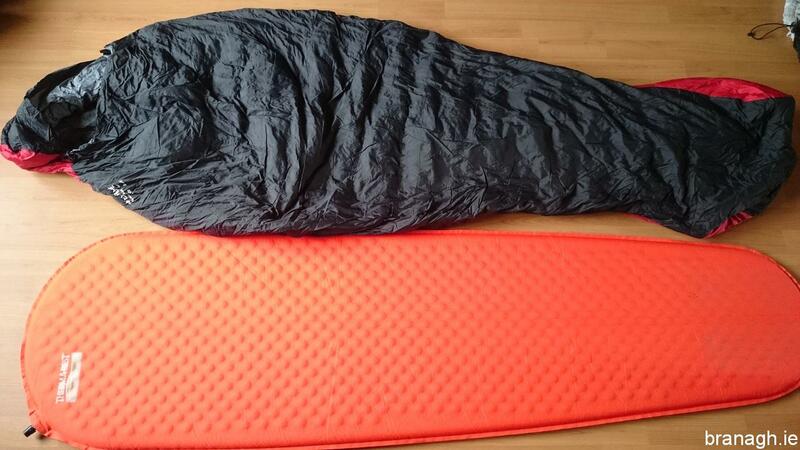 The sleeping bag is from Mountain Wharehouse. It is 900 fill down. It has a comfort rating of -9C. 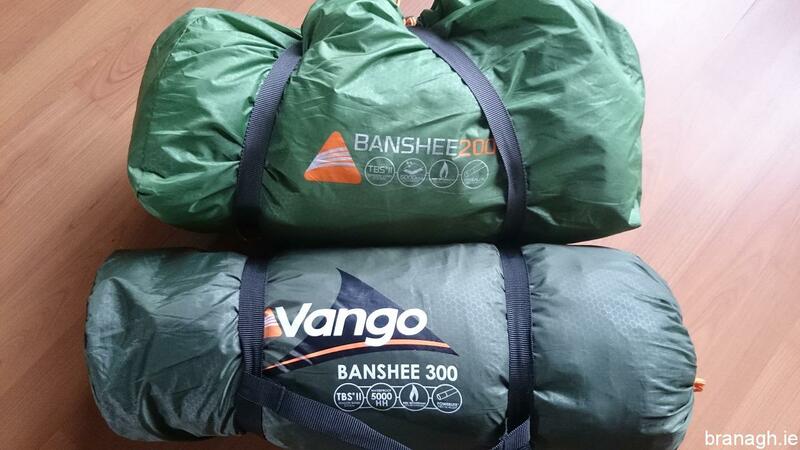 I have used this high in the Himalayas and also on some very cold winter summit camps in the Mournes. It has worked well so far for the price as I paid only about half what you would expect to pay for a down sleeping bag. My Thermarest is a must when camping to keep me off the cold ground. It is amazing how small and lightweight this is to carry. Only 300 grams. I bought a second identical Thermarest for when my other half joings me on camping trips. 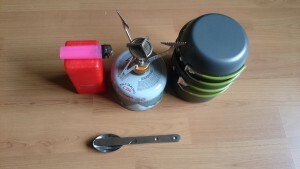 I carry some basic cooking equipment on overnight trips for reheating food or boiling water for tea and soup. The little gas stove is made by Vango and can stay lit is quite a breeze. It fits neatly into the little plastic box with enough room to fit a lighter in also. My GoPro is the source of most of the video you will find on this site. It is a Hero 3+ Silver and I always shoot 1080p@60 with it. I have multiple extra batteries, memory cards and accessories. 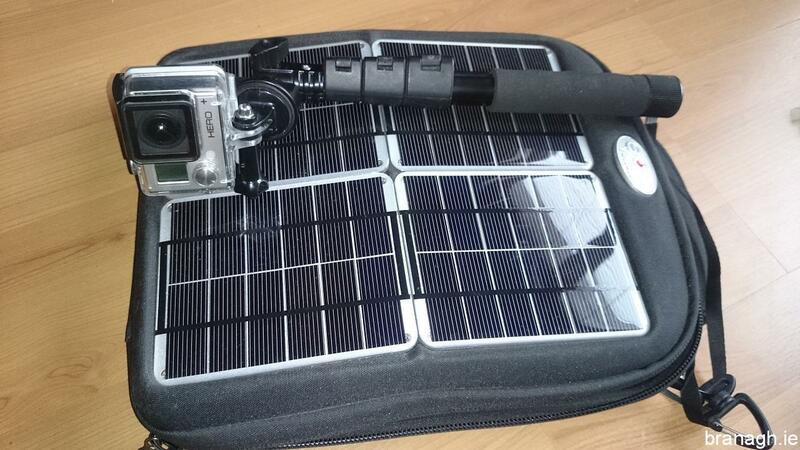 The solar charger in the photo is by Voltaic. It is an 8 Watt panel combined with a 10Ah rechargeable battery inside. 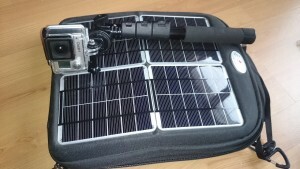 It generated enough power on both my Kilimanjaro and Himalayan trips to power the Gopro, my phone and also the phones of some others on the trips.